Studio portrait of a sergeant pilot. Mounted, framed and glazed. Overall size approximately 27.5 x 37.5cm. 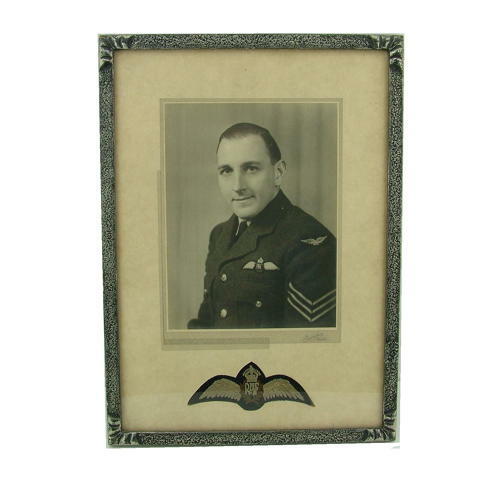 The image size is approximately 16 x 20cm and the mount has been cut to insert a set of flat pilot wings, presumably belonging to the airman in the photograph. Good clear image. The wings look good but do have some loss of felt at the edges in places. The mount is signed 'A Waddilour, Halton' (?). The frame moulding is wood with a 'silvered' finish. Great original display piece. Stock code NIV-P1.